The Days of Johann, an agility dog! : Gettin' the yard ready for winter! Gettin' the yard ready for winter! It's that time again, raking leaves, cutting back perennials, one last mow. Mum's been putting it off, but she just can't much longer. It's starting to get kind of cold out there. But this weekend's weather predictions indicate some warmer days, so hopefully she can get all the yard work done. I love it when Mum works in the yard. 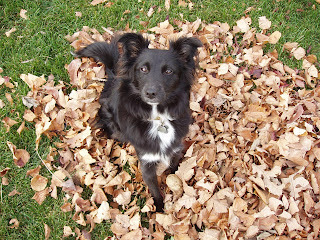 One of my favorite things is playing in the leaves - they're wet, they're stinky, they're soft and smell sooooo good! She could hire a company like pathway landscape to help with all the work, but we'd sure miss a really fun day! oh Johann you look sooo handsome in them leaves. your mama is not gonna wash you now cos leaves smell so goood!